This design does not require artifice to enhance its elegant look. Smoke Colorplan heavy board is foil-blocked in a white typeface, with a white bevel edge . 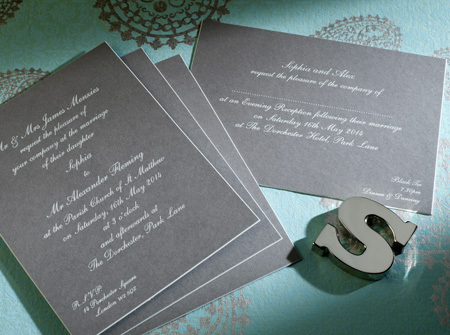 The standard wedding invitation is printed on a 7″ x 5.5″ heavyweight card, supplied with white envelopes (unlined). The invitation can be adapted to your preferred style and you have the option to alter: size, ink colour, print style and font, plate sinking, card colour, gilt edge colour, lined envelopes. 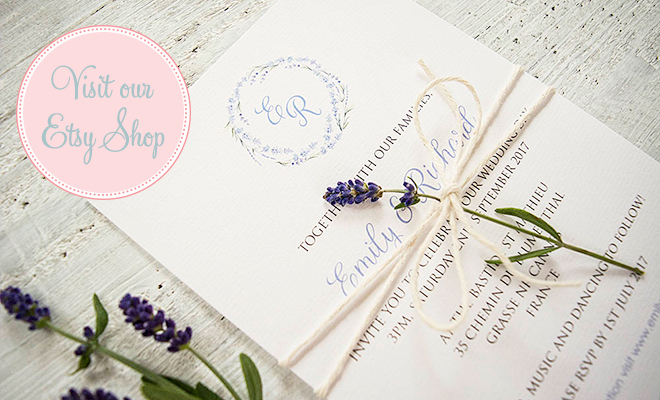 Our wedding is in Tuscany and we would like a rustic yet chic theme to our stationary with gray, white and perhaps lavender.